The peel adhesion test is used to determine the force required to de-bond two components joined by an adhesive. The test result, also known as bond strength, is generally represented as N (force to de-bond) / 25mm or 50mm (depending on specimen width). Quality control – where the glued component needs to meet a minimum bond strength value. Adhesive curing – determine the optimum temperature and pressure required to give the maximum bond strength. Adhesive behaviour – determine the effect of temperature, humidity and environmental conditions can have on the bond strength. Applications: Adhesives are widely used in various industries including textiles, fabrics, labels, laminates and composites. Peel adhesion testing is applicable to almost all components which are bonded together using adhesives. In 90 degree peel test, a constant 900 angle is maintained whilst the two glued components are peeled apart. The average load required to separate the two, over the length of the specimen is recorded and expressed as N/25mm. Other methods of expressing test results include average peak/trough loads and customer defined calculations. Sample requirement – generally a set of 5 specimens of size 20 mm width and 200 mm length are required. These can be directly cut from the product or prepared under laboratory condition. One of the two glued components should be flexible enough to be bent 900 without breaking. 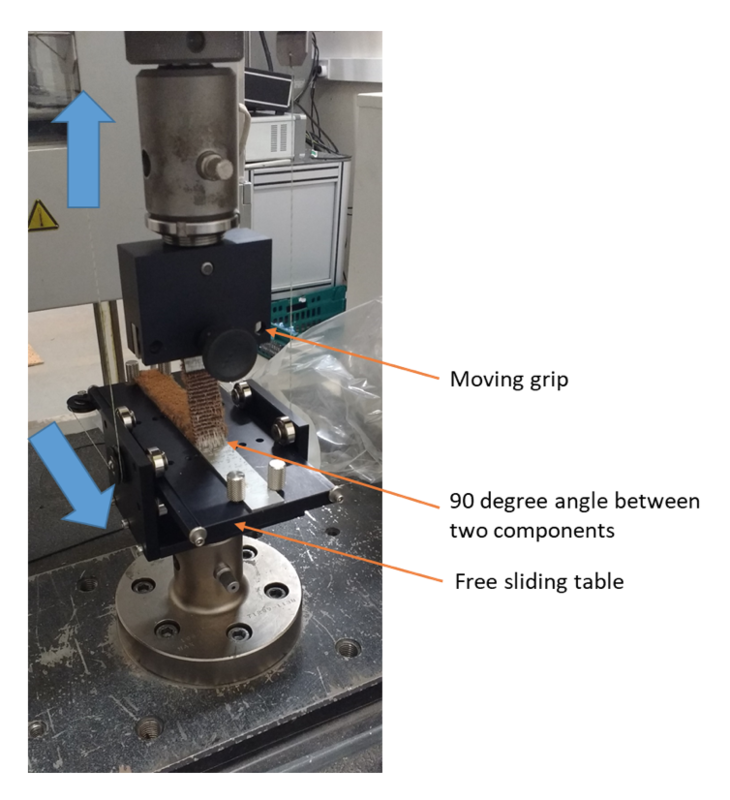 Test setup – The test specimen is clamped on a free moving table. From one end of the specimen, either mechanically or chemically de-bond or separate the two components, 40mm in length. The separated top component is clamped in the moving vice, attached to a moving crosshead. The two components are peeled apart by movement of the crosshead. The test speeds are generally 300mm/min or as defined by standard. The free moving table is attached to crosshead using a pulley and rope mechanism, such that the traverse movement of table is at the same rate as the crosshead movement, thus maintaining a constant 900 angle between the two components. In 180 degree peel test, a constant 1800 angle is maintained whilst the two glued components are peeled apart. The average load required to separate the two, over the length of the specimen is recorded and expressed as N/25mm. Other methods of expressing test results include average peak/trough loads and customer defined calculations. Sample requirement – generally a set of 5 specimens of size 20 mm width and 250 mm length are required. These can be directly cut from the product or prepared under laboratory condition. One of the two glued components should be flexible enough to be bent 180 degrees without breaking. 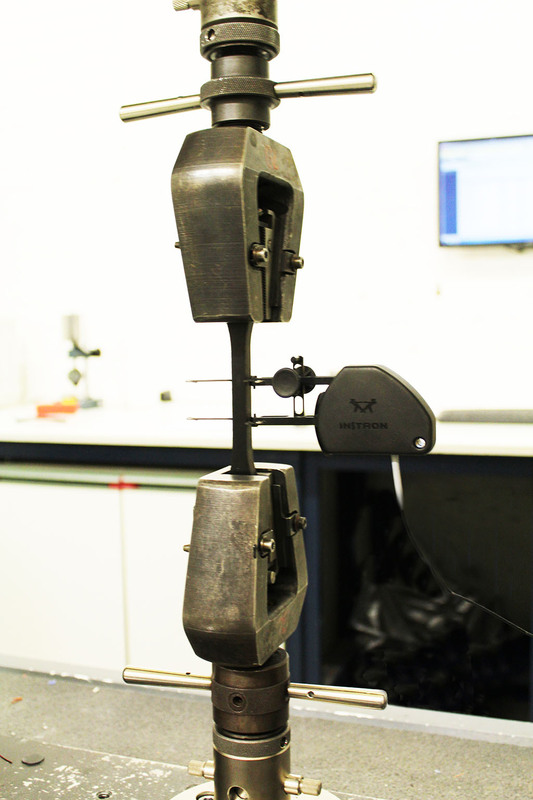 Test setup – The test specimen is clamped on a fixed grip. 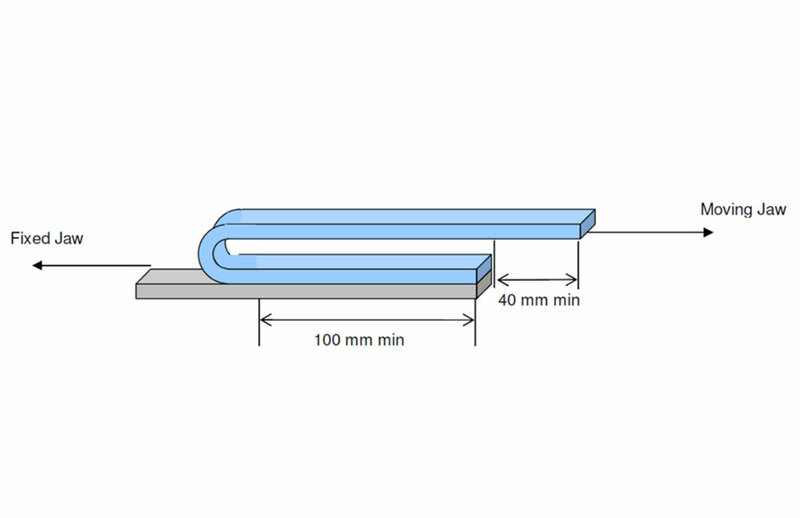 From one end of the specimen, either mechanically or chemically de-bond or separate the two components, 140mm in length. The separated top component is clamped in the moving vice, attached to a moving crosshead. The two components are peeled apart by movement of the crosshead. The test speeds are generally 300mm/min or as defined by standard. The following figure shows the test schematic. 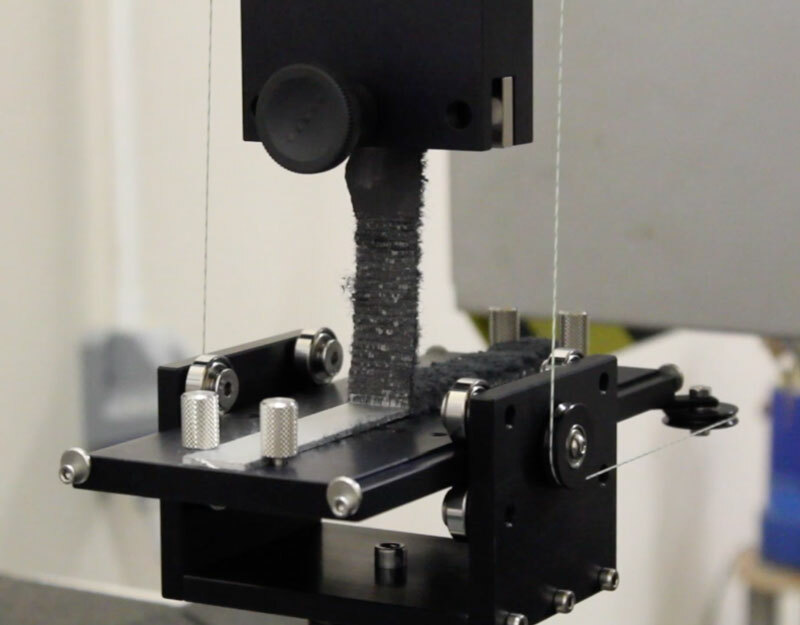 In addition to the peel adhesion test, Impact Solutions offer a range of services and testing. To view our full list of testing and services, click here.